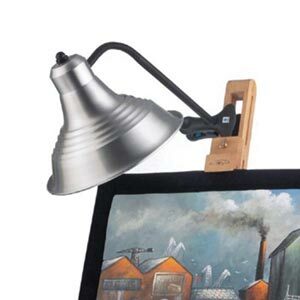 Specially designed for painting, drawing or displaying on an easel. The lamp can also be easily clamped on to any flat surface. The lamp hood is attached to a flexible arm which allows you to move and direct the light source in a variety of positions and angles. Light source is 11 watt low energy/heat daylight simulation bulb. Supplied with bulb, clamp and long lead. Aluminum/black.